Actions will be taking place in over 400 communities across 48 countries to raise awareness about the role of fossil fuel investment in climate change. Today at noon, the heart of New York’s financial district will be filled with activists demanding that their schools, local governments and institutions divest their investment holdings from fossil fuels. Actions will be taking place in over 400 communities across 48 countries as part of Global Divestment Day to raise awareness about the role of fossil fuel investment in perpetuating climate change and the risk investors face if they remain vested in an industry that must leave the majority of its main product in the ground to protect the climate. 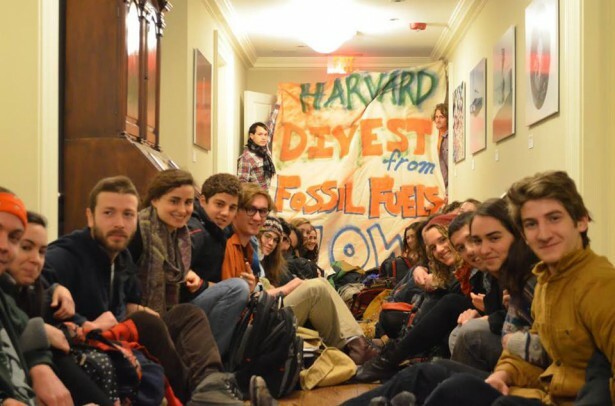 Yesterday, on the eve of Global Divestment Day, 34 Harvard students staged a sit-in outside their president’s office demanding divestment from fossil fuels. Harvard has repeatedly stated that they will not divest. But these students refuse to take “no” for an answer because they say their future depends on a livable climate. Divest Harvard had done significant work to win support for their campaign. In a referendum on divestment, 72 percent of the participating student body voted in favor. Additionally, 2013 Harvard faculty have signed petitions asking the university to divest its endowment from the fossil fuel industry. Similarly, students from the City University of New York have continued to organize support for divestment. After getting divestment resolutions passed by students at 13 CUNY colleges, including the University Student Senate, CUNY Divest will be attending the public hearing at Brooklyn Borough Hall on Feb. 17 to demand that CUNY Trustees take a stance on fossil fuel divestment. Meanwhile, last month, the New School agreed to divest its endowment from fossil fuels. And New York University students are also preparing to take action on Global Divestment Day. NYU Divest member Priya Mulgaonkar explained that NYU students are planning a bold Valentine’s Day themed action that will publicize the issue on campus and highlight the moral irresponsibility of the university to continue its investments in the fossil fuel industry. She says that the bureaucratic slow down won’t prevent the students from keeping the pressure on the administration and believes that the board and president will likely only be swayed by a show of mass support at the Board of Trustees presentation in May. While they won’t be staging a sit-in, students note that they need to keep the pressure up. While their president, John Sexton, has agreed that students can present their case for divestment to the trustees this year, it’s important for them to show that the campaign is keeping momentum going. On the heels of the People’s Climate March, which brought nearly 400,000 people to New York City in September to demand action on climate change, activists in New York City have been using some of the same arts spaces to make creative props for their rally on Global Divestment Day. The afternoon rally will be filled with speakers from local college student campaigns, community groups, financial institutions and government officials. Earlier this week, local activist groups met at an arts workspace in Brooklyn to create props for the Friday rally, including small “Go Fossil Free” flags and big orange “X” signs — a symbol of the divestment movement. Among those in attendance to help make the screenprints and signs was Lynne Harriton, a retired teacher who is now part of the local 350NYC climate action group working to divest New York City pensions from the top 200 fossil fuel companies. Harriton said she initially had concerns about pensioners like herself, who rely on the income. 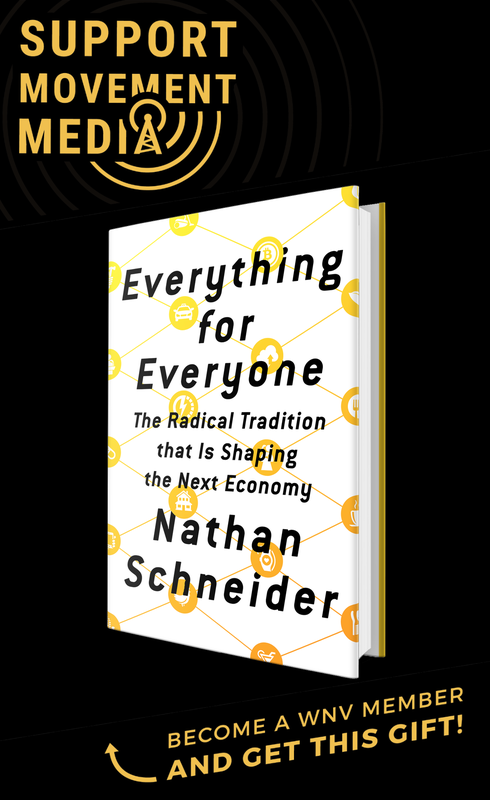 But those concerns have been assuaged by her research into how the pension system works. At the same time, though, she cares deeply about understanding how divestment will work, which is why she’s excited to see 350NYC advocating for a study examining any potential risks that pensions may face if they divest. But that study will also require investigation into what would happen if new climate laws limit the use of fossil fuels. As Lisa DiCaprio, a professor of social sciences at NYU explained, “By divesting now, institutional investors will avoid the future devaluation of fossil fuel stocks from various factors, such as the new EPA carbon rules, state and municipal goals for the reduction of greenhouse gas emissions, the use of alternative fuels for transportation, and the increasing amount of electricity generated by renewable forms of energy.” This is why, the divestment movement gives Harriton hope. Although she has worked hard for her pension, she said that she also wants to make the world a better place. In the days leading up to Global Divestment Day, however, the fossil fuel industry started fighting back — something many participants see as an indication of their success. To date, over 180 institutions have committed to divestment. In New York City, pledges to divest have come from many notable institutions, including the Union Theological Seminary, the North Star Fund and Rockefeller Brothers Fund. Amy Miller, a divestment organizer for 350.org, said that Global Divestment Day marks an important turning point for the movement.